Hamilton: The Revolution is the third post in a series on Individuality. Read the first and second. We hold these truths to be self-evident, that all men are created equal. If you hear someone saying these famed words with a beat, then you’ve come across someone who has been bitten by the Hamilton bug. I’m talking about Hamilton, the Broadway musical that is making waves in the theatre world with ripples in contemporary American culture. As someone whose day job is as far away as it can be from the Arts, I am immensely fascinated by the artist’s mind. How do artists create? How do they think? What thought process occurs when they work? What is it like to operate with the right brain in dominance? These questions, of course, are decidedly left-brained, which, I suspect, miss the whole essence of artistic endeavors. It seems to me that the Arts involve more nonlinear processes, merging divergent thoughts and feelings that may at some point converge into a masterpiece. The actual work from the blank canvas to a painting may take a short time, but the process of creation has likely started long before that moment of inspiration. 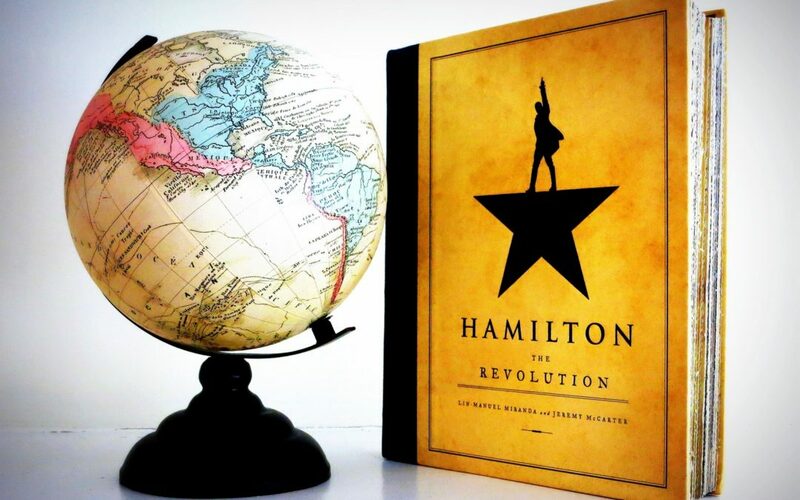 Which is why I’m crazy about one of my latest reads, Hamilton: The Revolution by Lin-Manuel Miranda and Jeremy McCarter, that unveils a little of the creative process, the story of how this revolutionary Broadway musical came about. There’s a marvelous story of individuality here. Hamilton is about the life of Alexander Hamilton, the guy on the $10 bill (of which I was completely ignorant before this musical), one of the Founding Fathers of the United States and the first Secretary of the Treasury. It traces his life during the American Revolution and the early years of the nation, to his death. Sounds like a bland historical statement? Yes. But, Hamilton is anything but boring. Lin-Manuel Miranda, the writer and creator of the musical, said in an interview, “We take it as a given that hip-hop music is the music of the revolution.” That’s right. This is a hip-hop musical, a sound that is not typical Broadway. It’s fast-paced, energetic, delivering high words-per-minute density that covers vast amount of information in mere minutes. Cabinet debates are performed as rap battles, with contemporary language that makes these idealized Founding Fathers accessible to the 21st century audience. Lin-Manuel is a master wordsmith. There are 4 dozens of songs in this musical, much more than typical Broadway shows, and he wrote them all. I love the story of how it began, how he connected Founding Father to hip-hop. As I went through the creation story in the book, it became abundantly clear that Lin was probably the only person on the planet whose brain could birth this breakthrough musical. The marriage of an avid reader, history learner, writer, hip-hop connoisseur, rapper, freestyler, and musical buff in his personhood, plus the friends who collaborated with him, are what made this possible. If that’s not a story of individuality, I don’t know what is. Lin said something profound about individuality in the last 1 minute of this interview. The book Hamilton: The Revolution traverses the 7 years between Lin’s first moments of inspiration in 2008 to the show opening on Broadway in August 2015. It tells the stories of how the songs came about and what inspired them. The complete libretto is reproduced here (on gorgeous papers) with Lin’s annotations, plus snapshots of his notebook pages when he first wrote the lyrics. In other words, it’s a little peek into his brilliant mind. It also tells the stories of the many collaborators that built the masterpiece, that even though Lin’s name has the strongest association with the musical, the revolution did not happen just because of one person. Need more reasons to read Hamilton: The Revolution? Keep reading. The book touches upon the fallacies through which we see history, how in hindsight revolutions may look obvious and inevitable, but in fact at the moment, they were “unprecedented and all but impossible to imagine ahead of time.” It’s hindsight bias. There’s also our faulty memory and how unreliable it is in reproducing sequence of events, something they experienced in putting this book together. If we couldn’t keep our recent facts right, how are we expecting something from 240 years ago to be entirely solid. The book is a precious record of the experiences of the artists today as they are living through them. It is contemporary, and thus can capture thoughts and feelings more accurately. We know how hard it is to piece together something from the past, to capture the atmosphere and essence of the events, even in the presence of evidence. In a way, this book too is a piece of history. Even though Lin wrote the musical, the creation of Hamilton involved many bright minds. Genius work is often a collaborative effort. My favorite story is of Alex Lacamoire who was in charge of orchestrating the music, tweaking each part of the 10-person band to get the music exactly right and tell the story as best as they can. I’ve been listening to the cast album for a few days now, and I am simply blown away by the incredibly layered composition of the music. There was also the stage director, stressing over little details to reproduce 18th century New York. These are things that the audience may never notice, but contribute to the feel and atmosphere of the stage, which help the actors get into their stories more. With each piece, the revolution becomes less of a mythical story into a story of community, of hard work, and of ingenuity. There are iterations, false starts, and revelatory moments. But most of all, it’s a composite of individuals, with distinct individuality and gifts, pushing for something that has never been done before. Check your inbox to confirm!